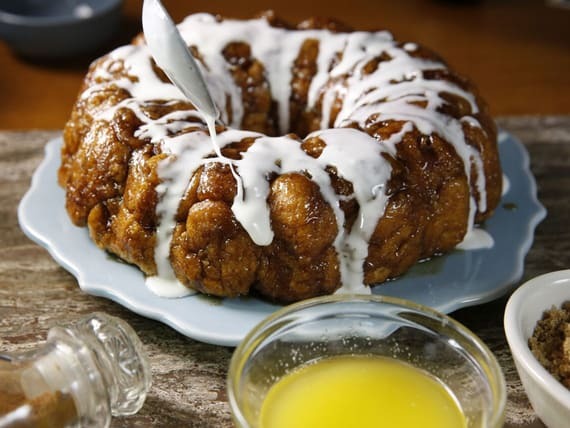 Grease or coat a Bundt pan with cooking spray. In a small bowl, combine warm water, yeast and sugar and let sit for 5 minutes. Combine Silk and margarine in a saucepan and cook until butter melts. Cool until just warm to the touch. Combine yeast and Silk mixtures in bowl of a stand mixer fitted with a dough hook or paddle. Add flour and mix until dough forms, about 2 minutes. Remove from bowl and knead dough on a floured surface for 4-5 minutes until dough springs back when poked with a finger. Place in a greased bowl, cover with plastic wrap and leave in a warm place to rise for 1-2 hours until doubled. In a separate small bowl, combine margarine and vanilla. Once dough has doubled, pull apart into 40-45 pieces, lining them up on a baking sheet or flour-dusted countertop. Roll each piece into a ball (doesn’t have to be perfect), dip in melted butter and roll in cinnamon sugar. Place in prepared Bundt pan and repeat with remaining pieces. Cover, put in a warm place and let double again until dough is about 1-2 inches from top of pan, 1-2 hours. Bake for 30-40 minutes, until top is lightly brown and cinnamon sugar is bubbling. Cool for 5 minutes and turn out onto a plate to cool. Combine powdered sugar, Silk and vanilla until pourable. Drizzle glaze onto bread. Serve while warm or cool.